Climbing "Roof of the world". Day 6. 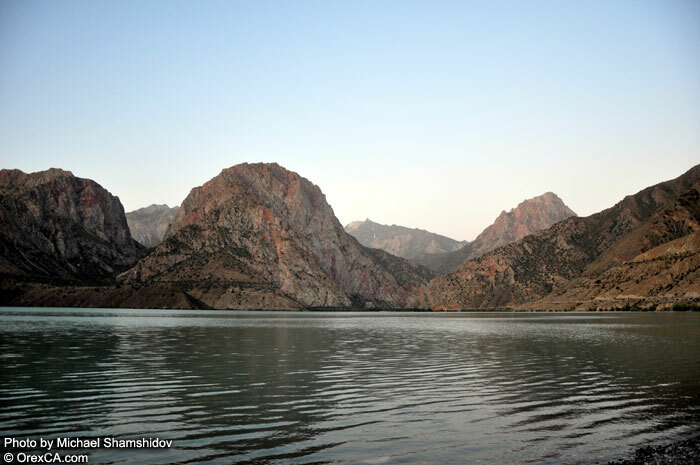 "In the name of Iskandar the Two-horned"
At a dawn a pearl of Fann Mountains - the magic lake of marvelous beauty bearing the name of the great conqueror of antiquity is as perfect as at sunset- we were personally convinced of it, just having opened eyes early in the morning. Having had breakfast, we went to the lake detour to Panchchashma - five springs beating from a rock on the opposite edge of the lake. 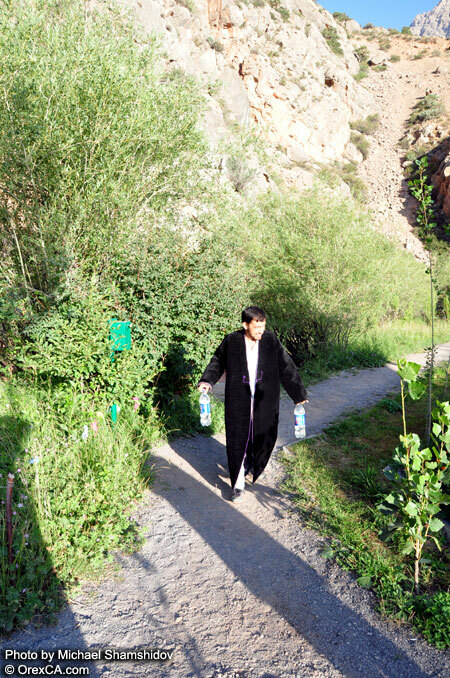 This place is full of trees, the water streaming from these springs is really tasty and all possible curing and improving properties are attributed to it. According to the custom you can have a snack with the flat cake soaked in it. And this is a kind of a ritual. There is a small president residence there, one of many hundreds (someone said that from 500), spread out over all territory of the "small-big" country. 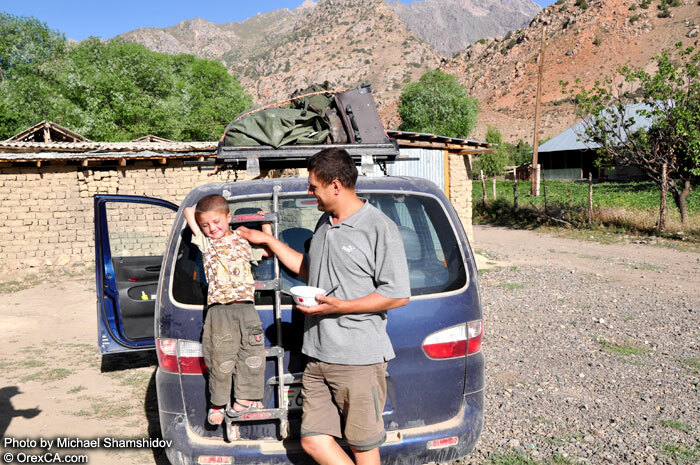 Further, along the river running into the lake we began to climb up the mountains and found the picturesque kishlak of Sarytag located in rather wide mountain valley, stretched along the small river with the same name and under the top of 3904 m altitude - the highest in this area. Houses here are not exotic clay dwellings which we saw in other mountain kishlaks, and built on quite modern (national) manners. According to Lonely Planet there are 4 guest houses in Sarytage and we visited two of them. Conditions are quite t livable, in one of two and in these two houses there is a sauna. Cost is identical - 10$ per day + 5$ for food. Small local children learnt foreign languages and take tourists to tracks. 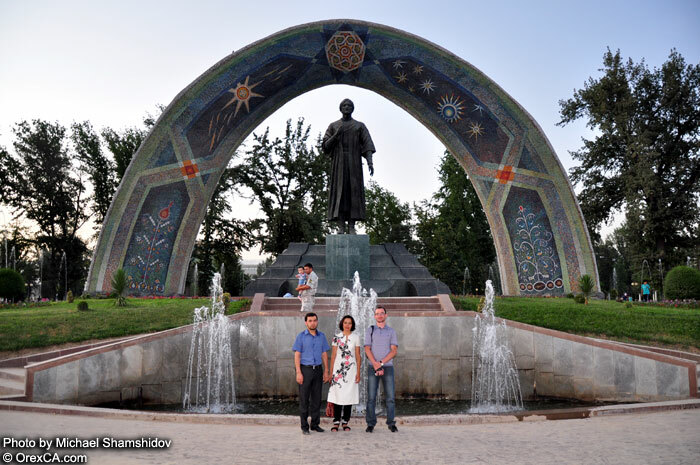 This activity is supervised by Zarafshan Tourism Development Association - a public organization which has been created within the limits of the project "Tourism based on communities". On the way back we stopped in front of the bridge through the river Iskanderdarya running from the lake and went along it on a track leading to one more miracle of Fann Mountains - a kilometer below a source, the river breaks into a narrow gorge with powerful waterfall of 38 meter height! 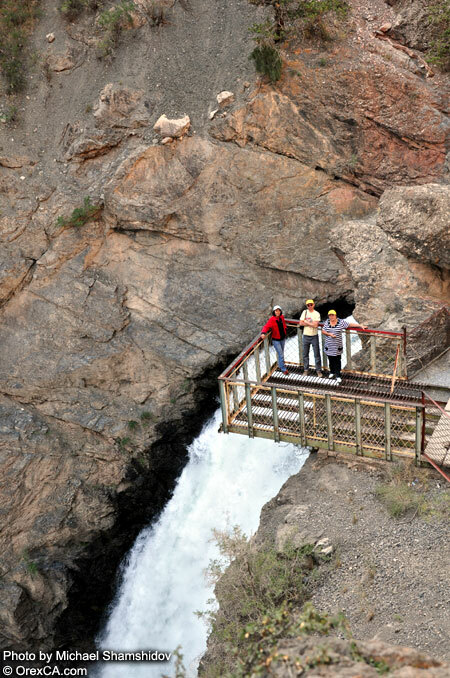 Right over a swallow-hole where the falls go down, there is a metal observation platform with a trellised bottom. However, it is almost impossible to get closer to falls to see it in all magnificence as the inclined edge of the gorge is covered by small chad, foully creeping underfoot, and the tourist fond of photographing risks to fall down to a roaring abyss. This mighty falls of Iskanderdarya is quite often named "Fann Niagara" though it would be more exact to compare it to the African Victoria falls which also falls in a narrow crack, not giving possibility to see it in all beauty. Here it is possible to spend eternity, staying in the mixed condition of delight and sense of insignificance before the Power of Nature, but … it is time to go back and here we go along storming Iskanderdarya. Having found the highway, we went to Anzob pass. We stopped in a roadside choyhona hanging over abrupt coast of Fandarya to have lunch. In search for a toilet we found out that it was not only on other side of the road, but also on a decent distance -50 meters! It was not the only case on our trip, later, even in the capital we had to face remoteness and small size of latrines, but everything was cleared up when it appeared that Tadjiks (real ones), during a feast, a common potlatch or meals, it is impolite to go to public toilets and men, for example, even hesitate to do it (i.e. to go to a toilet) in public. 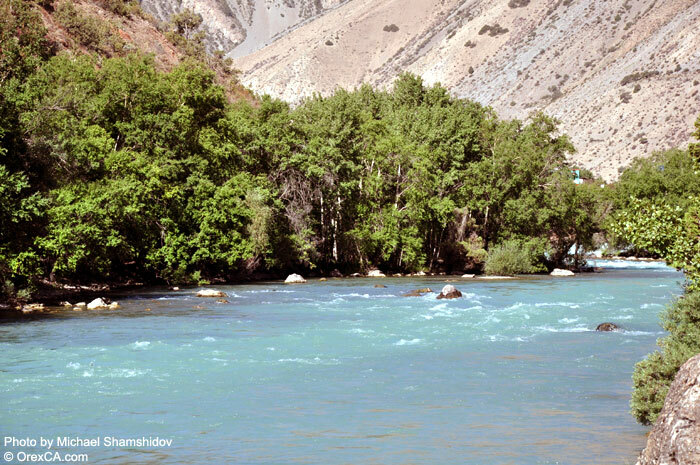 Sorry for humdrum of life, but where and how Tadjiks manage with the needs of nature? - It remained mystery for us. But here infinite 15 minutes ended and … yes there is light in the end of the tunnel! 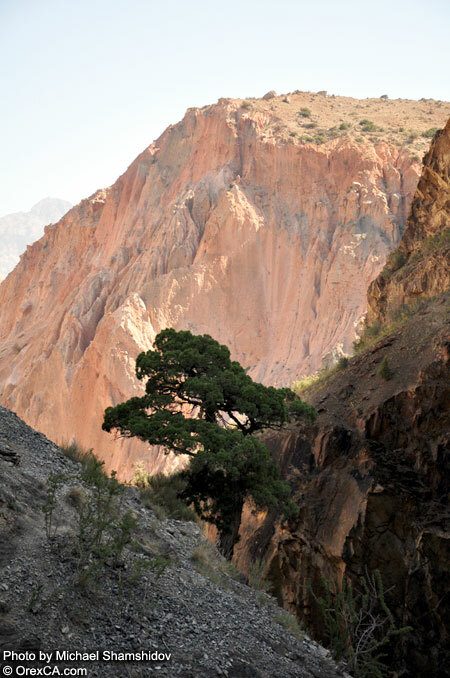 However, the role of this tunnel is great as it provides all-the-year-round automobile communication between northern and southern areas of Tajikistan. After all earlier, during the winter period, northern areas were cut off from the basic territory of the country within 6 months. The tunnel has reduced road between Khojend and Dushanbe to 60 km, and the way on a new route takes 5 hours less now. It didn't take us long to go down the pass, high mountains became more and more picturesque, and the river along the road -wider and rougher. Structures along the river were similar either to country houses, or rest zones. Their quantity and luxury since the certain moment began to increase in a progression and here - welcome - we go through known Varzob gorge - the Dushanbe "Rublevka" - huge "country" area (country more likely on a cadastre, than on appearance) where houses and mini castles cluster on both sides between road and the river and compete to outdo each other by sophisticated architecture and modern construction materials, and all of them overlook a violent stream of Varzob. Speedometer showed 140 km from Iskanderkul to Varzob. Near the gate to one of such mini castles we were waited by Hayrulla - our friend from Dushanbe, a young businessman from a rich and prestigious family. After friendly hand shakes we entered his acres - big and magnificent summer residence right on the river, connected with even bigger area where we saw 3-storey hotel. Hospitable Hayrulla offered us two tempting variants - either stay with him here in Varzob (and go to Dushanbe from here), or accommodate in the city hotel belonging to his family. Despite big temptation of a nice rest at a cool noisy stream, all of us, however, chose the second variant and here we rush 15 km distance on a smooth road in Hayrulla's BMW X6 to Dushanbe. 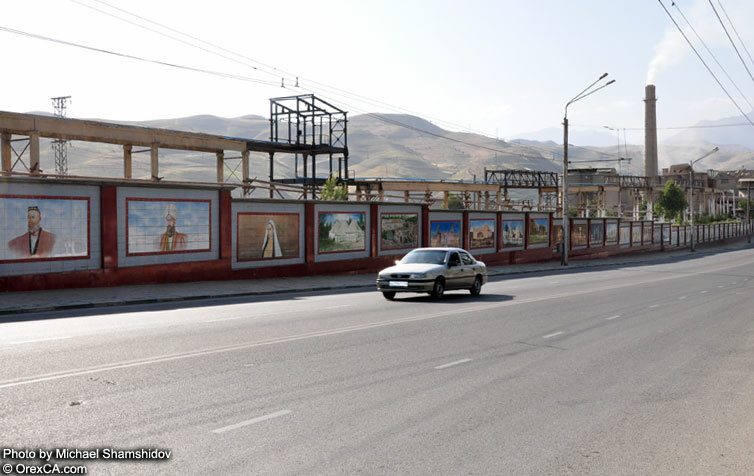 The first thing that we saw was the wall of Dushanbe cement plan - and this is really worth seeing - probably more than a kilometer of the wall, where the tile lays out panels with history and achievements of Tajikistan. We have defined this place, as a separate tourist product with possible excursions for an hour or 2 (granting competent guide-historian). 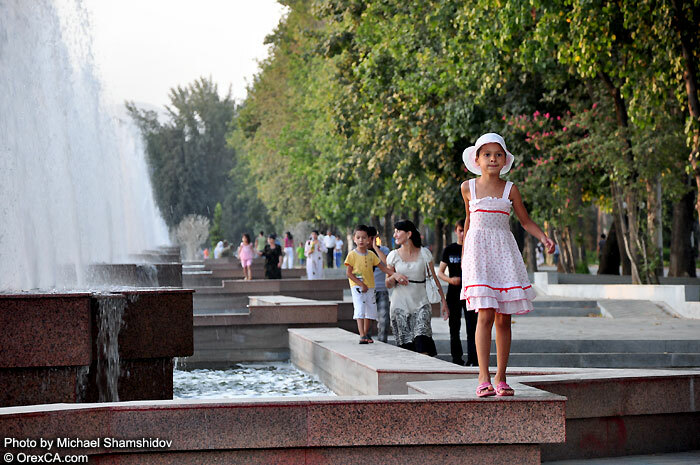 Dushanbe is a green, very green city. Platans tower over narrow streets, avenues and parks are everywhere in the central part of the city, architecture is basically Soviet, middle 20th. 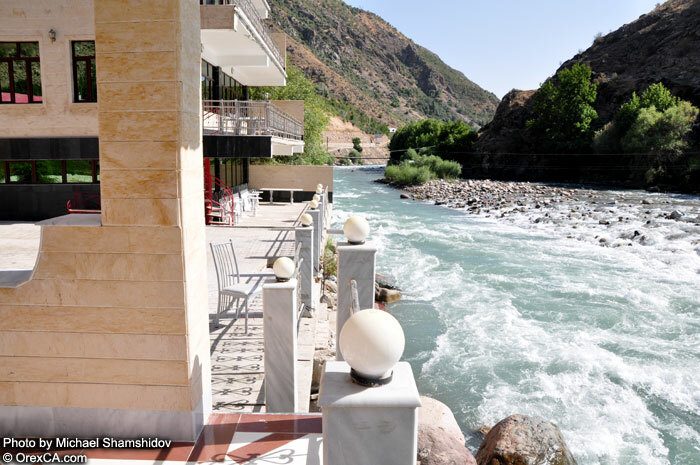 Having accommodated in a cozy and comfortable Tahti-Shohi Hotel, we, at first went to a small semi basement shop with the well-known Tadjik stones and souvenirs where Hursheda opa, made purposeful purchase of every possible products from Pamir and especially semi-precious stones from Tajikistan for her Khujant jewelry store. Here you can't but purchasing and this is a fine place for to buy souvenirs and gifts to take home. Besides Hursheda opa purchased wholesale and we summed up what we bought to her part and the price appeared to be reasonable. 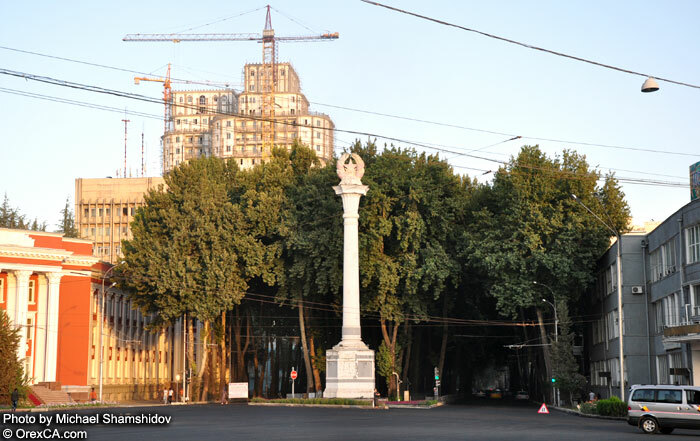 Excursion to Somoni Square- a central square of the capital which, in fact, having been extended and reconstructed according to 20 - year anniversary of Independence. Nevertheless, it was possible to walk and to take photo in some places. 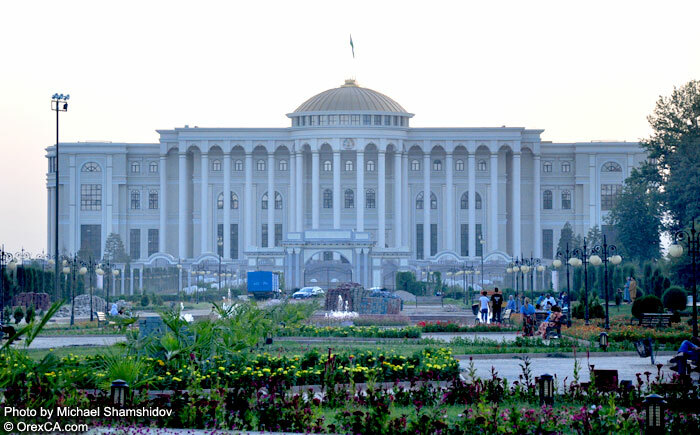 Huge new presidential palace, the highest in the world flagstaff with a glowing flag of Tajikistan, a monument of Rudaki - we succeeded to see all of them before sunset. In the evening we had dinner at a restaurant in the Italian style located on the roof of a business centre Poytaht (Capital). The service was quite good, however sometimes they forgot to bring a dish. In this glamour place for Dushanbe we who have recently gone down from (Fann) mountains, had a chance to take a glance at pastime of Dushanbe gilded youth, men and women of consequence, young and cheerful foreigners - some of them were expatriates working there in numerous humanitarian and other noncommercial organizations.